Happy Monday! I’m currently blogging from my iPhone at the pool so my apologizes if this post seems a bit thrown together. Yes, I am at the pool. Apparently that’s what all underemployed recent college graduates do in their free time. I am pretending like I am on a tropical vacation rather than in the thick of graduate school purgatory. At this point it’s just a waiting game. I’ve done everything that I can to submit a strong application, now it’s a matter of my final recommendation letter being submitted and being officially notified. “excellent student” “very strong application” “great fit for the program” and my all time favorite”I don’t see why you wouldn’t get in”. But all of those compliments aside…nothing has been decided yet and I feel like I am about to explode! Seeing as how I am now a mature adult I decided to channel this anxiety in a positive way by exhausting my legs this morning at the football stadium. I ran up the stairs and then walked down them… Every row all the way from A to DDD! I did a whole section of the stadium. I planned to do another set but by the time I was finished my legs were shaking uncontrollably. It actually felt great! 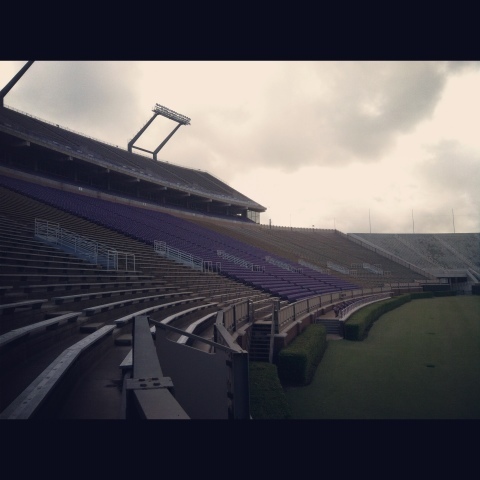 I was scared that it was going to be sketchy and that someone from maintenance would yell at me for trespassing on Dowdy Ficklen property, but the only other person I saw was working out also. It made for a great morning. I can only hope that the rest of the week pans out as nicely.